There are so many unforgettable joys which go along with being a new parent. Trying to manually mix a bottle of formula while the baby cries impatiently to be fed sure isn’t one of them. 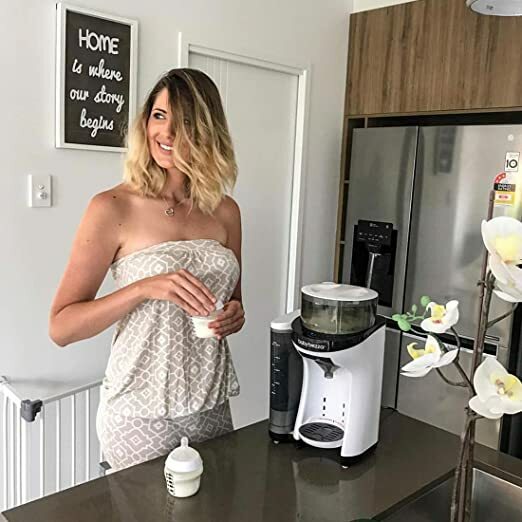 Recently, I was struggling to get a bottle ready when my sister asked me, “Why don’t you just get a formula maker?” I looked at her blankly, and she told me there are devices on the market which can prepare formula for you. On her recommendation, I purchased the Baby Brezza Formula Pro. It has made a huge difference, removing a lot of daily stress both for me and my baby. But there’s no denying though that Formula Pro isn’t a small purchase. Is it worth it? I decided to share my experiences with you so that you can make an informed decision. Baby Brezza Formula Pro Reviews 2019: What Is It? How Do You Use Baby Brezza Formula Pro? First of all, if you are like I was, perhaps you are not all that familiar with formula makers. 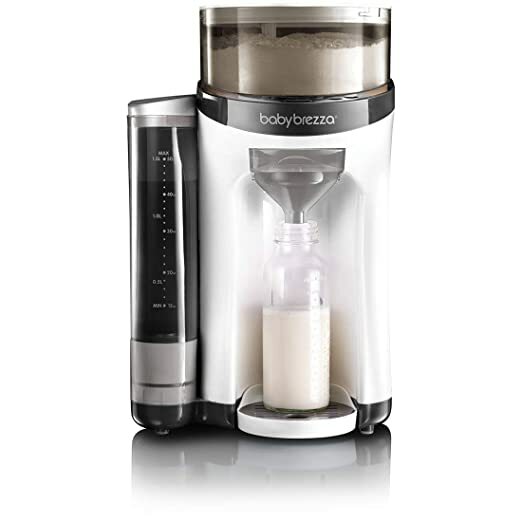 Baby Brezza Formula Pro is simply a product which automates formula preparation. Without a formula maker, you have to take around 5 minutes to mix your formula and heat it up to the right temperature by hand. 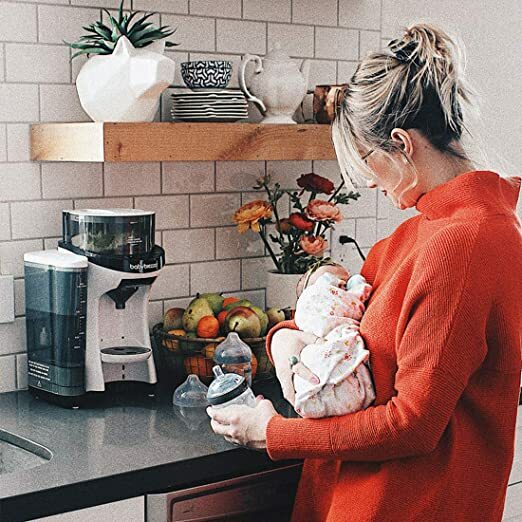 Baby Brezza Formula Pro does all that for you, freeing up time and your hands to do other things. That means your baby gets fed faster and with less hassle. And the formula comes out perfect every time. Let’s take a look at the specifications and features. Formula Pro measures 9.25” x 8.25” x 15”. It is compact enough to fit on most countertops, and has a sleek modern appearance which complements your kitchen. The control panel is minimalist, featuring a temperature gauge on the left, start and stop buttons on the right, and ounce selection in the middle. The appliance works fast, mixing the formula and heating it in a matter of seconds. It comes out free of air bubbles and ready for baby to drink. I have yet to encounter a single bottle which cannot be used with this formula mixer. As far as formulas go, there are a few which I have run into which are not compatible, but it seems to be able to handle the vast majority which is on the market. Add the formula powder into the container. 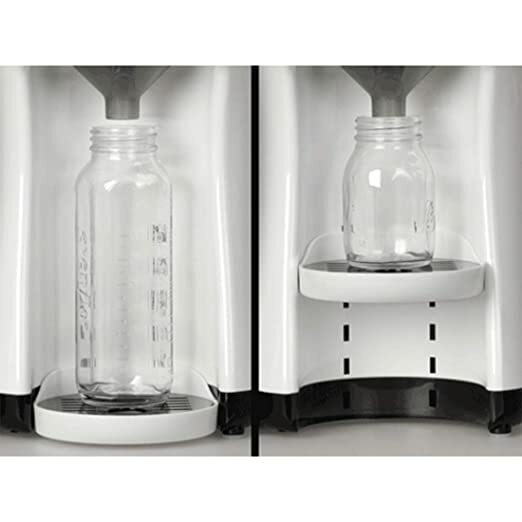 One thing I love about this is that you can store a lot of formula right inside the appliance—up to 700 grams. That means that if you are using an 8-ounce bottle, you can prepare 20 bottles for your baby before you need to pour in more formula. Pour water into the removable tank, which has a 50-ounce capacity. Fit the bottle into the machine. On the control panel, select how many ounces you want to prepare. Wait while the formula is mixed, heated and added to the bottle. This takes no more than half a minute. If you are preparing less, it may be ready even quicker. That’s it! You then can grab your bottle and start feeding your baby. When I was a kid, I thought I had to peel avocados. Somehow it didn’t occur to me to cut them in half and scoop out the fruit. When I finally figured it out, I laughed so hard at myself for making my own life so difficult. Getting Baby Brezza Formula Pro was just like that! When I prepared my first bottle of formula, I couldn’t get over how much easier it was. It made me wonder why I’d put myself through manually mixing formula for so long. I’ve heard people say that this appliance is a “luxury,” but if you are as busy and stressed in your day-to-day life as I am, I’d call it a necessity. That is especially true if you have twins! There were a few things which took some time getting used to, and I did make some mistakes before I got the routine down. I’ll give you some tips below so that you can avoid those mishaps and get the most out of using Formula Pro. One more thing—this appliance is easy to clean. You can remove the water tank to wash it. You do need to do so by hand, but that’s pretty much all the routine maintenance you need to worry about. Do not exceed the max fill line, or the water may overflow. Look up the appropriate setting for the brand and type of formula you are using. This ensures you get the expected consistency. If you spill any formula, wipe the powder off right away so it doesn’t cake together later. You can use this product with practically any bottle and formula of your choice. Formula Pro could not be easier or faster to use. Precision mixing and heating means reliable results time and again. Cleaning the appliance is a breeze. Formula Pro is aesthetically pleasing and looks great in the kitchen. 1 ounce increments would be nice for greater control. Occasionally you may find a brand of formula which is not compatible. I can’t recommend Baby Brezza Formula Pro highly enough. Yes, you need to take care with the fill line, and yes, you do need to do your homework to pick the right setting. But this appliance will save you so much time every day. You won’t make mistakes any more with consistency, and won’t have to worry about baby’s formula being too hot or too cold. Give it a try and see for yourself. It’s a small investment with a huge payoff!